If you’ve ever been on an African Safari then you know that magical feeling of freedom that comes when you are overlooking the open plains. African home decor aims to encompass that spirit and freedom in your home. The nice thing about this look is that you can have a hint of Africa or go the whole hog and deck out your home like a safari resort. This decor trend is very earthy and natural but without that country feel. 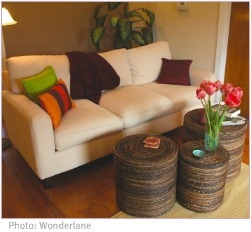 It can be paired well with contemporary decor where the accent features would be African themed. 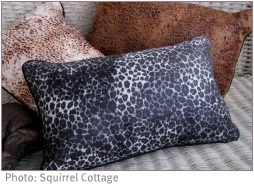 Accessories: Animal skin prints such as zebra, antelope, and leopard. Colourful hand-painted batik prints; horns, masks and other artefacts like spears. Reads or interesting thin, twisted branches; Woven plates and bowls; wooden animal statues - giraffes are popular and quirky, and they don’t take up much space since they are tall and not that wide. If you are going for more of a safari feel, then add big leafy green plants and some pictures of the “big five” - lion, leopard, rhino, buffalo, and elephant. This is a decorative but comfortable style, if you have artefacts from different countries in Africa you will have the perfect backdrop to display them in this natural way of decorating. Lets get decorating - I want to show you how I would go about transforming this plain bedroom below. 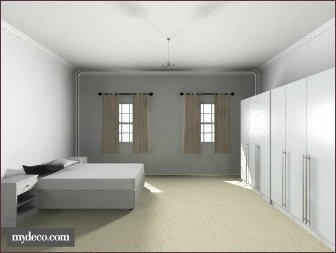 This very standard bedroom has beige carpets and white melamine cupboards. 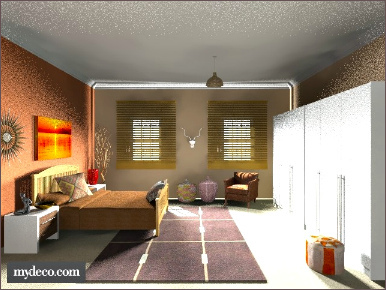 The next picture is of our transformed African home decor bedroom. 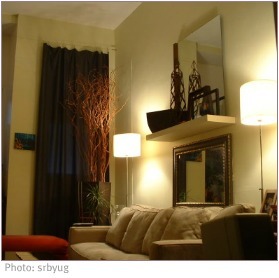 To keep on trend, the walls were painted in a rich earthy brown, with a feature wall in a nice sunrise-orange. The standard bed was swapped for a wooden frame bed, and the curtains were exchanged for bamboo blinds. All the wood accents add warmth to the room. The accessories used echo nature: dried sticks, antlers, a picture of an African sunset, as well as carved wooden bowls, and woven baskets. I could have used an animal skin rug over the carpet, but I liked this rug better as it is reminiscent of animal hide but more contemporary.